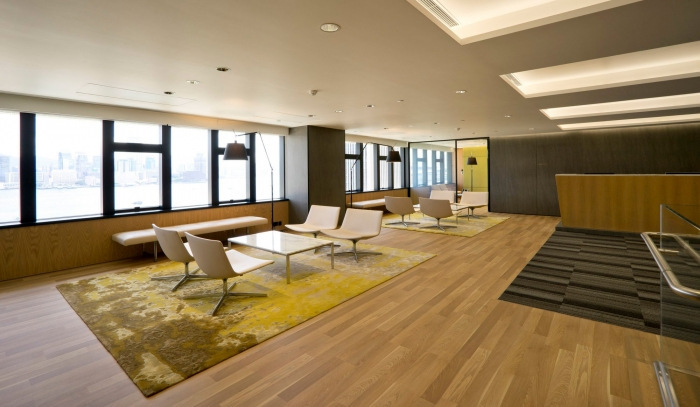 Circa ia completed the offices for global law firm Baker McKenzie, located in Hong Kong. With these changes needed throughout the legal profession, to maintain a competitive edge; our client made a bold decision to co-locate their 2 offices into a 4 floor location; and in the process investigate the minimum acceptable single lawyer office size. This investigation became an analysis of acoustics in a small space, customized sliding doors; & a customized furniture solution to allow the correct visitors & storage space. For the support staff, our goal was to create a workstation that offered maximum reachable and adjoining file space; so as to allow an efficient work setting. The net result was not just reducing the practice premises footprint, but introducing a more informal workstation setting between fee-earners; & support staff. This workplace setting was balanced with our client’s growing demand for a larger seminar space; & client rooms for the combined practice numbers. In response we developed 3 large rooms & an open coffee and eating area; which can all link together in a series of combinations & settings. The combined solution allowed our client to reduce their overall costs, while increasing their ability to hold larger client functions.